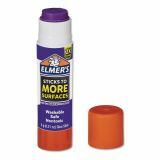 Goes on purple to help you see exactly where glue is. 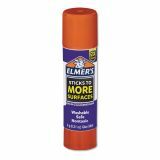 Dries clear and applies smoothly for a mess-free appearance. 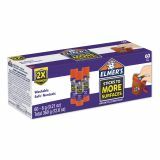 Elmer's Extra-Strength School Glue Sticks, 0.21 oz, Purple/Clear, 60/Carton - This all-purpose glue sticks to way more than just paper. It goes on purple but dries clear, so you can see exactly where you're attaching charts, pictures, buttons, fabric, and more. 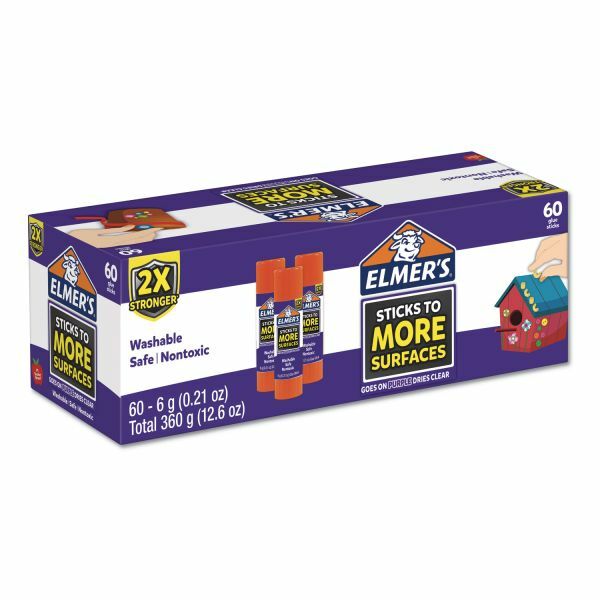 The ideal school glue, these glue sticks feature a washable formula that's photo safe, so you can tackle tough arts and crafts projects that require a strong bond. Ideal for classrooms, crafting and homes. Works on paper, wood, cardboard, buttons, cardstock, ceramic, felt/fabric and more.